Some local Cornwall perspectives on the recent UK vote to leave the European Union. A special moment from our travels in 2003. The little dog is the star of the show. Join me as I "get high" in Paris! A serendipitous encounter in Paimpont, France, sets us off in search of a holy well in the nearby village of Tréhorenteuc and a very unexpected experience. I’ve just read a very detailed analysis of the world after Paris by Rabbi Michael Lerner. This article comes as close as anything I have read so far to suggest what we in the West can do to heal this violent and fragmented world of ours. The gruesome memories of ancient “holy” war still reverberate in the gorgeous valleys in this isolated region of southern France. 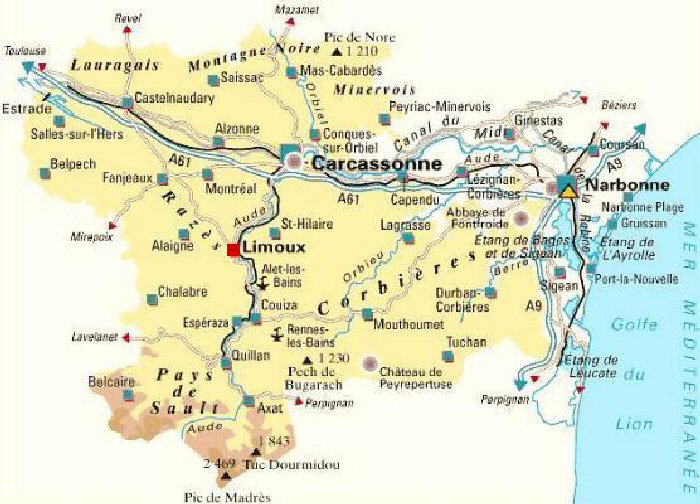 In 1209 Pope Innocent III (what deceit in that name) and the French King Philip the Fair (another misnomer) launched a 20-year military campaign to wipe out the Cathar heresy in the south of France. Why did the Roman Catholic Church initiate this blood-bath, which became known as the Albigensian Crusade? On the surface it was a matter of theology, but behind it was the usual unbridled thirst for wealth and power. The Cathar region is only a few hours from our home town in Catalonia, but we have avoided staying there because of this bloody history. However, we were recently invited to visit friends who live there. 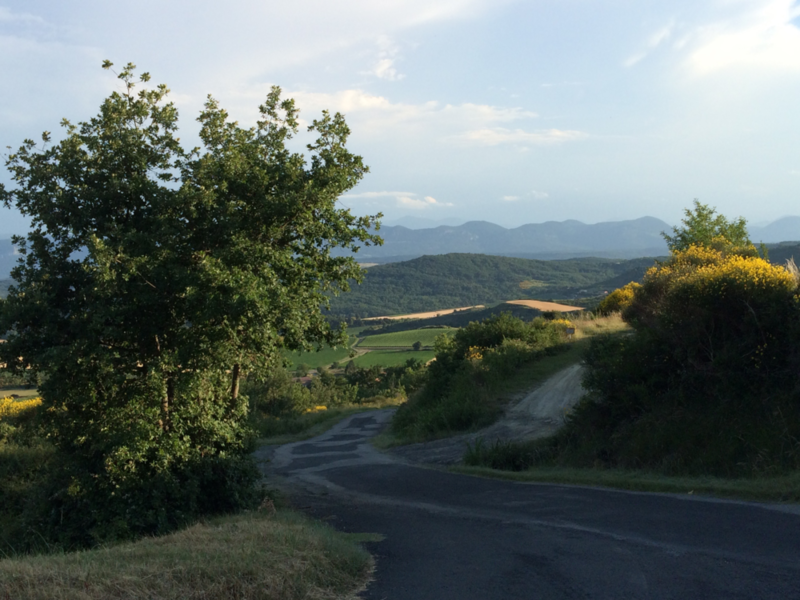 So we rented a car and drove three hours across the Pyrenees to stay for a week with Stephen Marcus and Barbara Kroll in their house in a rural hamlet near Couiza. The area is popular with tourists because of its many ruined castles, forest-covered hills, charming towns, and spas with hot springs. It is also a favorite with conspiracy theorists, followers of Mary Magdalene, and Cathar sympathizers who are drawn to its many mysteries and secrets. Let me introduce you to some people you might like to meet and places you might like to visit. Rennes le Château was made famous by Dan Brown’s “The Da Vinci Code,” preceded by “The Holy Blood and the Holy Grail,” which describe various conspiracies involving the 19th-century priest, Father Béringer Sauniére. He remodeled the church in bizarre ways and built a mansion and tower next door. Tobi and Gerda Dobler used to run Le Jardin de Marie Restaurant in the town. They were our genial hosts when we visited the village. They lead tours in the area (CLICK). Kai Lilliendal and Sus Krassél have conducted lengthy research on the symbolism of the Rennes le Château church (CLICK). Their website is a treasure-trove of videos, photos, and essays on the area. They gave us a fantastic tour of the church, and they have apartments for rent in Rennes-les-Bains, a beautiful spa town nearby. Rennes-les-Bains is also the part-time residence of our friend, harpist/singer and sound healer Ani Williams, whose inspiring concert was a high point of our visit (CLICK). 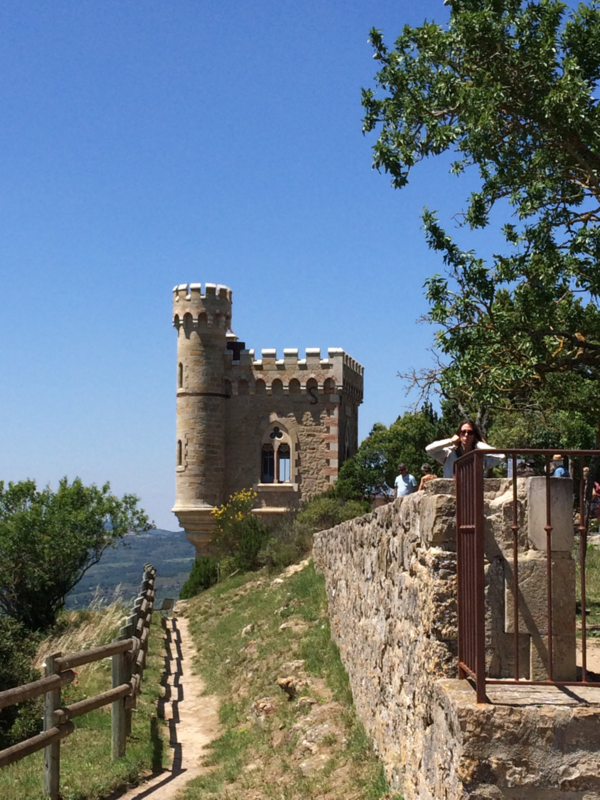 Ani leads very special tours in southern France and the Girona area. She also teaches sound-healing work in Sedona, AZ, USA. Kai Lilliendal led Ani, Barbara, and us on a strenuous hike into the hills above Rennes-les-Bains to the so-called “Devil’s Seat” or “Throne of Isis,” which is a large carved-out boulder near an iron-rich spring. We also had a delightful visit with a wonderfully open-hearted group of friends who live in Brenac, near Quillan. Sarah and Pierre-Jean Canquouet and Jeanne Tharrault took us to their amazing gardens (complete with goats, waterfalls, vegetables, and flowers) and served us a delicious lunch. Sarah and Pierre’s daughter Devayani is a gifted pianist and composer (CLICK), who gives concerts and has a number of CDs. We visited a number of Cathar sites with Stephen and Barbara, including the village of Montségur, where we met weaver Ragnhild Almelid Simon (CLICK) and her husband, Janos, at their le Pelerin B & B and weaving workshop. Elyn coveted her gorgeous hand-woven shawls. We also had an excellent lunch in the Cathar fortress town of Minerve, overlooking the gorge of the rivers La Cesse and Le Briant (CLICK). On a completely different note, Stephen and Barbara introduced us to Releasing (CLICK). That work continues to reverberate with us. I’m sure that 800 years ago they—and we—would have been tried for heresy!